This week just sharing a few images using some of the new programs that are out there. It seems you just have to try them all out and push the sliders to the limits to see what you get. I have been really pleased with all the ones used in these images. Note that all the shown plugin/software websites are linked in the sidebar of my Tidbits Blog. 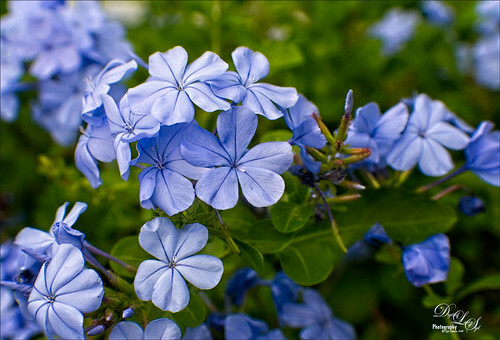 The above macro shot is of some Plumbago blooms growing in my backyard. Very little was done to this image in On1 Photo Raw 2019, but what it did was significant. I really like how sharp and clear this image is. The Effects tab was opened and the image was warmed up a little using the Color Adjustment Filter’s Yellow button, then the Default Sunshine filter, and the Dynamic Contrast (my favorite On1 filter) that just sharpened up the image beautifully. Last thing done was to open up the Local Adjustments tab and add some Detail Structure set to 40 and paint on the petals in a mask. This was all done while using this program as a plug-in to Lightroom. The image was finalized in PS so that I could put a signature block on it and a layer style stroke around the outside for posting. I am really starting to love the update they have made to this program. This image was first worked on in Lightroom – used one of Serge Ramelli’s presets from his Welcome Kit called Bad Weather 4 – it gave a good place to start adjusting the image. His preset uses a lot of Gradient Filters and Radial Filters that need to be adjusted and moved for each image so that was done here to get the beautiful lighting effect. In PS, the new Content Aware-Fill command was used to clean up the background which had several buildings sprinkled around. The secret sauce in this image was using Skylum’s Luminar 2018. To get the really sharp effect, Skylum’s free download category called Joel Grimes Preset Pack was selected – I love this set of presets. (Here’s the link to download them directly – they are called Pro Photographer and Artist Presets – then go to File -> Add Custom Presets Pack and select them to add in). The Detailed Warmth preset was selected and set to 39% opacity. A New Layer was added above and the AI Filter Boost was set to 40, and the new AI Sky Enhancer Boost set to 33. The Image Radiance filter was set to an Amount of 38 and an overall filter Amount of 89. Back in PS, a Curves Adjustment Layer and Flypaper Bird Brushes Crows 3 were added at 43% layer opacity. So the birds look natural, I always clip (ALT+click between the layers) a Pattern Adjustment Layer to them – in this case a dark brown pattern set to 100% scale. 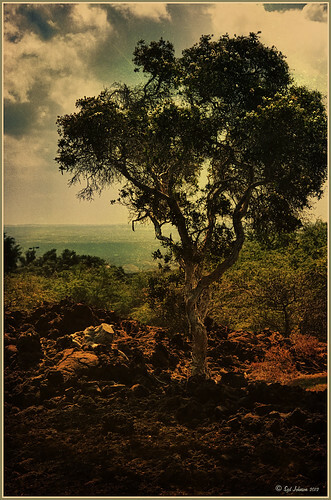 On a New Layer set to Overlay blend mode was added on top – with a soft low opacity black brush, the foreground was painted in lightly to darken it slightly. That was it. Luminar does such a beautiful job on landscapes. Definitely their strong point! I have loved this program from the moment I tried it out. I like the fact that it does not create that sort of exaggerated HDR effect that was so popular a while back. And I love that just one photo works fine in the software. 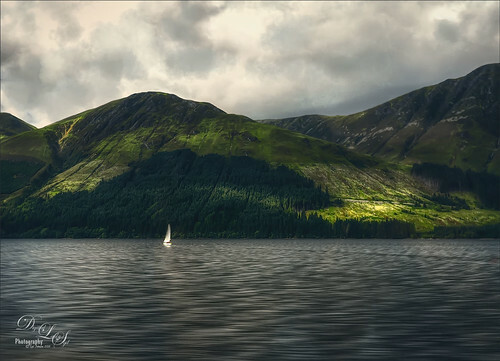 This image was taken somewhere in the highlands of Scotland – I was wishing I was on the sailboat when I took this image. Not a lot was done in Aurora – just applied a preset that really caught my attention in the Dramatic Collection called Sleepy Drama. In PS a Color Lookup Adjustment Layer was added and my favorite preset called Foggy Night was added and the opacity was set to 60%. On a New Layer the Sharpen Tool was used on the Sailboat. The biggest problem with this image was the sky. On another New Layer one of my very favorite brush sets, Grut’s FX Cloud Brushes, was opened and the Cloud Lumens Hi was selected using a touch of gray color to it to add into the clouds – the layer was then set to 76% opacity. These brushes are just excellent for these kind of quick touch ups! Last step was to add a Curves Adjustment Layer the add a little more contrast into the image. The original image was in tones of blues and green and looked very dreary. It is amazing what this plugin did for this image. WHICH HDR PROGRAM TO USE? WHAT A DILEMMA! This week I performed just a little comparison of the my HDR programs. I get so confused about which one I want to use and what the differences are between them so I decided to take the same image and run it through each of them. What I found out is although the basic image is the same, depending upon the HDR program used, a totally different look will be achieved. So what my final conclusion is that you need to decide up front what effect you like, and then choose the program that gives this result. That is why running an image through each program is so informative – it shows the subtle differences that need to be known to make the an intelligent choice. So below is the image example and a little info I learned about each software as I experimented. 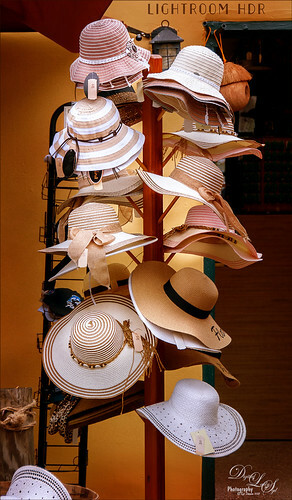 The image was taken of a Hat Rack that is outside a store on St. George Street in the historic district of St. Augustine, Florida. Also, all three images had a little work done in Photoshop – the price tag amounts were removed, the same High Pass filter set to 2.0 Radius and Overlay blend mode was used on each (except the On1 image which was sharpened enough and it caused haloing), and a Red Channel Luminosity Adjustment Layer was applied although different RGB settings were used for each. 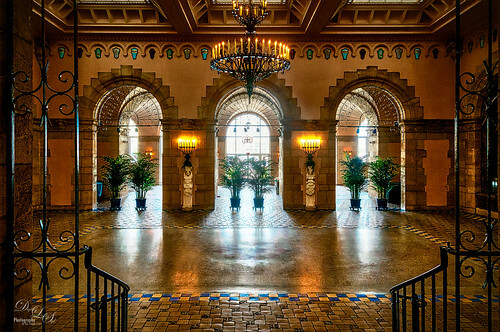 The top image is a 3 image HDR of the ballroom at Whitehall (Flagler Museum), Henry M. Flagler’s Residence in Palm Beach, Florida. It was post-processed using Aurora 2018. To begin with, I love this new HDR software. Why? Because it is so easy to use. Aurora (for website link see sidebar at my Tidbits Blog) have canned presets (and some more can be downloaded for free from within the program) and the interface is pretty simple. That said, there are a few problems if you are a Windows user. It is hard to navigate around the image when zoomed in is my first pet-peeve. The biggest problem is when using the Dodge & Burn filter which I really like on the image. The program did a great job in removing ghosting but the colors seem to be a little off to me. Below is the result I got using this program. (Here are the settings used on it: AU 2018 – HDR Basic: Temp 9, Tint 16, Exposure -0.44, Contrast -2, HDR Enhance 79, Smart Tone -31, Highlights 24, Whites 36, and Blacks -20; Color Vibrance 44, HDR Structure: Amount 78; Image Radiance Amount 41 and Brightness -20; HSL Sat Red 47, Orange -11, Aqua -67, and Blue -58; Dodge & Burn – set brush to 12% Strength and painted with Darken around the edges and with Lighten on the lighter parts of the hats; Vignette: Amount -62, Size 32, Roundness -51, Feather 53.) Overall, this is a great program, especially for Apple people, but it needs to be updated to the Apple version for Windows people to really get the full punch of the program. I decided to include this one since everyone probably owns it since it is free. When this program first came out several years ago there was a lot of excitement generated by this HDR software. I found it still works really good. There are lots of presets to try out and that is exactly how this image was started. It looks very different from the above – the colors are much truer. Is that the look I wanted? Maybe. The disadvantage in this program is there is no Dodge and Burn filter which is what I think made the first image more interesting. (Here are the settings used on this image: NIK HDR Efex Pro 2: Selected Pale & Structure and changed Tone Compression to -18%, Method Strength 41%, HDR Drama far left and the Color Sat to -14%. Add control point to reduce the effect on the bright items in the door on right. Added Vignette Lens 3 vignette and changed amount to -5%.) This is not a fatal flaw since this can be done in Photoshop. I am a little disturbed by the slight amount of haloing that I could not figure out how to reduce in the plug-in so I ended up hand cloning out – still some present. I am not sure this plug-in is still available as a stand-alone, but I have never used it this way. Overall, it gives a nice result and I am sure the haloing issue could be avoided with the proper settings. On1 software (for website link see sidebar at my Tidbits Blog) has come a long way in the last few years and their HDR filter within the software interface is pretty great. The HDR section is set up so that once the HDR images are selected in the Browse module, the Create HDR dialog opens showing two tabs, Tone & Color tab (with are the standard LR Basic sliders) and HDR Look (which has the compression slider among others). 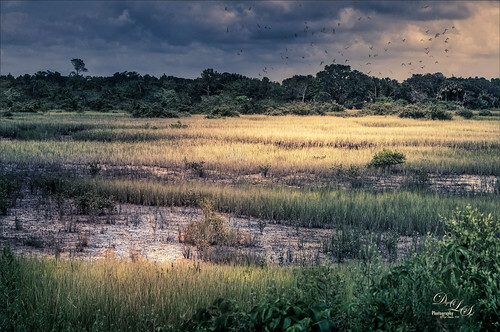 Once the HDR image is saved and created, the program lets you use their Develop module or Effects module to further enhance the image which opens a lot of extra possibilities. (Here are the settings used in image below: Create HDR-Tone & Color – Exposure -0.2, Contrast -12, Highlights 0, Shadows -17, Whites 1, Blacks -14, Structure 17, Haze -9, Temp 4650, Tint 4, and Vibrance 37 and HDR Look: Compression 51, Details 21, Clarity 27, Vibrance 10, Glow 0, and Grunge 7. Effects module: HDR with the settings from HDR Look show up; Dynamic Contrast: Small 6, Medium 61, and Large 43, Highlights 17, and Shadows -4; and Color Enhancer: Red Sat 10; Orange Brightness 10; and Blue Sat -11; and Vignette: Big Softy preset and Brightness -51, Size 38, Feather 100, and Roundness -56.) I have done several HDR images with this program and really like it. I found on a water scene it had a little trouble with the ghosting of some sailboat masts. But other than that I have gotten some great results. In this image it seems that the whites are much better than th two above. This is very easy to do in Lightroom – just select the images to create the HDR image, right click and choose Photo Merge -> HDR and in the HDR Merge Preview dialog, check the options you want and click Merge. It brings the new HDR image back into LR as a DNG file. I do not use DNG files usually, but have found not problems with it. Now you can do all the same adjustments that are made in LR normally. Major great and easy! The HDR image allows the Exposure slider to go from (+5) to (-5) to (+10) to (-10). I found the resulting HDR image almost sterile looking – no noise, color absolutely correct – almost a flat look. On the other hand it is very realistic. After doing the Basic changes in LR (Settings were: Basic panel-Tint +21, Exposure +0.71, Contrast -16, Highlights -100, Shadows -7, Whites +2, Blacks -48, Clarity +2, Vibrance +18, and Saturation +4; HSL Panel Luminance Orange -20 and Yellow -8; and with the Adjustment Brush set to Exposure 0.80, Clarity 77 and Sharpness 83, the hats were painted over. ), the photo was taken into PS. A Color Balance Adjustment Layer was used to add a little more brown-gold look to the image. Since there was not texture at all in this image on the background, a Digital Grain texture I had created a while back was applied on top. It did seem to help a little. So which of these programs did I prefer? This is such a hard one to decide. I did not use Photomatix Pro as I own version 3.3 and apparently they are on version 6.0 – I did not mind using it a few years ago as it gave very good results. They all gave sharp and clean images. I believe that Lightroom’s HDR effect is extremely realistic and that is perfect when you need something with really sharp lines. It does a fantastic job with this. On1 has this great advantage of also being tack sharp which one of the things I like about this program even when not doing HDR – their Dynamic Contrast filter is just fabulous! Their HDR is also very good. Nik HDR Efex Pro 2 may be lagging just slightly behind, but this is extremely power HDR software and if you cannot afford to buy new program, just download this one. It is still just fine for most image. The new guy for me, Aurora 2018, is really good – it is the brainchild of Trey Radcliff, a major HDR guru, so this is why it is so good and easy to use. 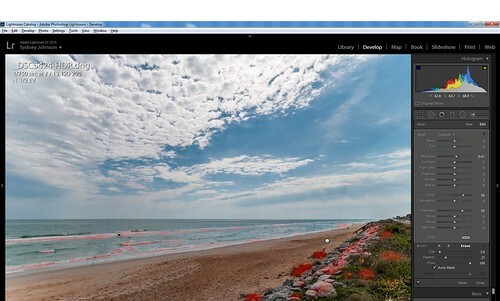 I thought it did a really good job on the Flagler Museum image which has a lot of exposure issues in it. Overall, the best way to figure this out is to try them all. I can see if I do not like the results of one software, try a different one – it will look different! HDR Using Photoshop Merge to HDR and Nik”s HDR EFex Pro and Silver Efex Pro? Wow! 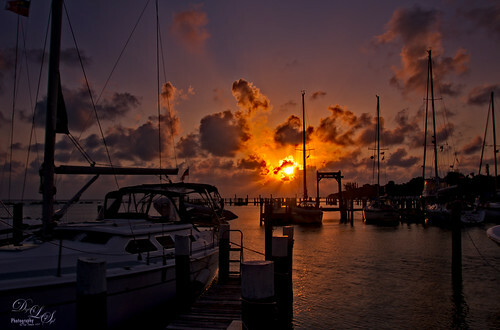 This sunset was taken at Spanish Cay in the Bahamas. Just doing a really quick blog and discussing the new HDR filter in On1 (for website, see sidebar link at my Tidbits Blog) Photo Raw 2018 software. I really gave the software a tough image to process – lots of wind so the flags and the lines on the foreground boat were slightly moving. I took 5 hand-held shots. All the midground and background objects looked perfect. But the foreground was a problem. In On1’s HDR dialog, the HDR was set to Very High for deghosting, but the ghosting effect was still obvious. I decided to compare the results with Lightroom’s fairly new HDR Photo Merge (select images and right click Photo Merge -> HDR) where the Deghost Amount was set to High – had no ghost issues at all! The problem for me is that I liked the Tone and Color effects in On1 better than what could be achieved in Photoshop or Lightroom. So what I did was highlight both HDR images in Lightroom (a tiff for On1 and dng for LR) and right clicked, and selected Edit In -> Open as Layers in Photoshop. In PS an Auto-align command (Edit -> Auto-align layers) and Crop Tool was done first. 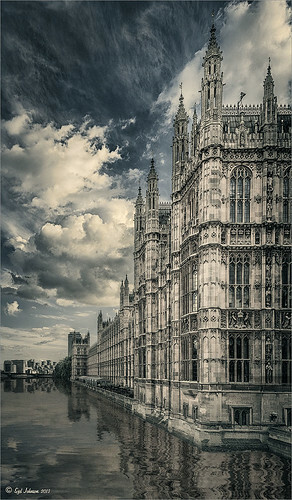 With a mask applied to the top On1 layer, the problems with the foreground lines and flags were corrected by using the Clone Stamp Tool set to 80% brush opacity. This took a lot of time but I liked the result. Basically what I wanted to pass on is, if possible do use a tripod to take your HDR images – it will help in abnormal conditions. If having a big problem with post-processing it with On1 HDR, then do a second HDR image using Lightroom’s Merge to HDR and stack the images. 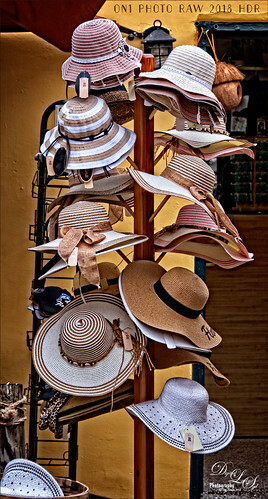 From Lightroom, all the images were selected and opened in Photoshop as individual files. Check Alignment if images not shot on a tripod. Same with Ghost Reduction – move slider at bottom to show image that shows image with movement that looks best as in clouds or trees. Always check Remove Chromatic Aberration. Now just presss Create HDR – a tiff file is created. The Default preset is automatically applied to the image. Now the fun is going through all the presets and see which one(s) look best on the image. Experiment with the sliders on the right. Tone Compression is the amount of HDR effect seen – set all the way left there is no HDR effect. Method Strength slider goes from very weak to very crunchy looking. All the other sliders can create some nice effects. If you find a combination you, just create a preset by pressing the (+) sign in the Custom section on the left. The above image used the Deep 2 preset to start. Here is a tip from one of my favorite Photoshop people, Scott Kelby, which he offered in his videos on this plug-in. Apply the HDR effect and then take the resulting effect into Nik Color Efex Pro 4 (another wonderful plug-in and is included in the download bundle) and select the Glamour Glow filter set to the default preset. He says it is the magic that really pulls the realistic HDR effect together and does not look over-the-top. That is what was done above. To finish up the image, the waterfall was blurred so it looks a little more like a long exposure. (See my Smoothing Out Those Waterfalls blog on how to do this.) In this case, two Motion Blur layers were created since the water flows in a couple different directions. Also the slight blue chromatic aberration edging in the small sky in the upper left was removed by using the technique in my A New Look at Chromatic Aberration blog – worked beautifully. That is all that was done. Here is an image that used the Nik HDR Efex Pro 2 plug-in that was done a while back. Just another good example of how this looks. I really like the effect in the skies. This image used Grannys Attic preset. Here is another example using the previous version, Nik HDR Efex Pro – I really liked how this image turned out – it the used Grannys Attic preset, but it had some different parameters in the first edition, which was also very nice. 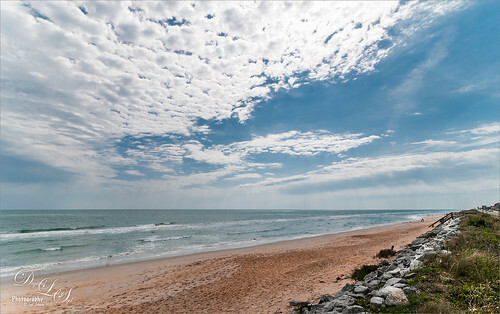 Images in this blog are of my local Flagler Beach, Florida, and were taken with my Nikon 10-24 mm wide-angle lens. This week I decided I should address this new technology that is only in Lightroom CC. Since I have not been shooting HDR for a while, it is not something I use that much. I have always used Photomatix and Nik HDR Efex Pro 2 plug-ins for my HDR images, so this is definitely an interesting update for Lightroom. Many die-hard HDR fans are not liking the results. My take on this process is that it is very good and it comes with Lightroom so you don’t have to buy it. I will probably use it when I can. So I am going to go through my Lightroom workflow real quick so you can see the screenshots for each step. The actual shooting using bracketed images to create an HDR image is a huge topic that I am not covering in this blog. It is recommended that you first do the Merge to HDR before doing any other changes in LR, especially the Adjustment Brush changes. 1. Need to first highlight each of the images to be merged into HDR. My images selected were using Exposure Compensations of -2 1/2, -1/2, and +1 1/2. Adobe says you only need to use 2 images, but some people say noise appears unless 3 are used. Apparently 3 images are enough to get good results, even if you have more bracketed. 2. Right click on one of the selected images and choose Photo Merge -> HDR. The following dialog will open showing the basic merged image. I decided to use all three HDR Options even though a tripod was used to shoot these images. Always use the Auto Align to be sure they are lined up correctly. Use Auto Tone to bring in the information for the light and dark tones from each image. Only need to use Deghost when you have some sort of action in the image. This could be people moving around or, as in this case, clouds and waves that can be moving quite a bit so the High setting was selected. By checking the Show Deghost Overlay, you can see where it deghosted. I believe it was quite windy when I took these images, so that is why the plants on the right foreground were deghosted. With each change selected, the image updates. 3. Click the Merge button when all settings are correct. Above shows the expected rather flat merged DNG image. The DNG file format is the same as a RAW file – it is just Adobe’s file extension for RAW files. I do not usually save my RAW files as DNGs, but use Nikon’s NEF file format when I import. This is really just personal taste. 4. Apply settings to really pop your image. First adjust the Exposure slider which now can be set between +10 to -10. The normal settings are from +5 to -5. Now since the blacks and whites are making the image so flat looking, set these. To get the best Auto blacks setting, hold SHIFT and double-click on the word Blacks – it will now be set at the position to get the best effect. You can still adjust it more if you do not like the results. Do the same for the Whites slider. Then add some Clarity and Vibrance to finish up. See the image under Step 6 to see the settings along with the HSL settings. 5. 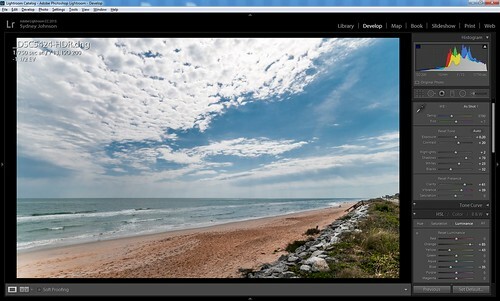 Use Lightroom’s Adjustment Brush to Dodge and Burn localized areas. The Adjustment Brush was used to some Brightening to very localized areas – the waves and some of the rocks. Above is a screenshot showing these areas as painted as a red overlay on the the image, and the brush settings used to get these results. Just a little Exposure was added (+0.47), some Clarity, and Sharpness so the waves show up a little better. Note that in this case the brush was set to a 100% Flow, but I do not always do this. For a more gentle effect, use a lower Flow amount and build up the effect as needed. Above the Adjustment Brush was used to add some Darkening or Burning effect to some localized areas – only the Exposure was set to -0.39 and a few parts of the sand were darkened. You can see the white dot that shows where the dodging was added before. Just click on it to further adjust the dodging effect. 6. Adding HSL slider settings. Here are the settings used for the Basic settings and the HSL Luminance settings for this image. I did not feel it needed anymore changes to the colors other that the Oranges and Blues adjustments. Overall the image looked pretty nice and balanced to me. 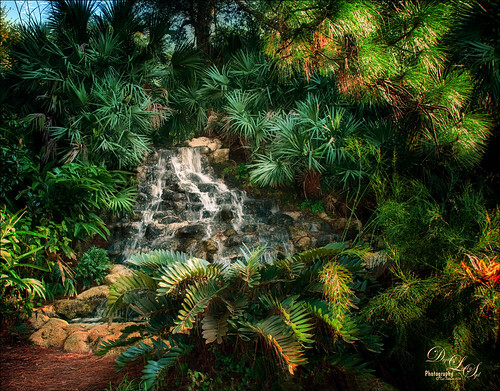 Below is another image created using the HDR process in Lightroom. I am really pleased with the lack of noise in the image – the DNG file was very sharp, but the colors still needed a little tweaking. 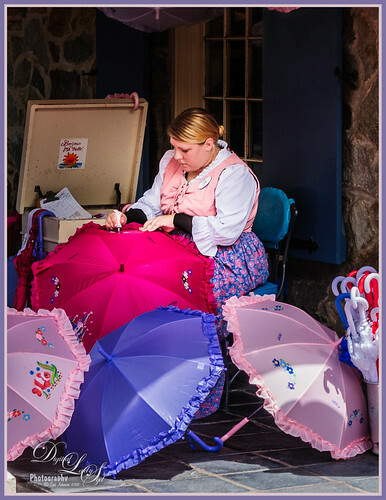 Some overall sharpening was done to the image in Lightroom and an Adjustment Brush was used to even out the shadows in the dark window shutter behind her. Also two Radial Filters were applied – just decreased Exposure slider for the darker vignette effect, and then increased it slightly to get the face and body lightened slightly. In Photoshop some clean up was done using the Spot Healing Brush and Clone Stamp Tool to remove a restraining rope that ran in front of the umbrellas. Also a final Curves Adjustment Layer was applied to just add a bit more contrast in the blacks. This could have been done in Lightroom as well. This week I decided to give a few examples of how I am getting the beautiful painterly look on images. This is the part of Photoshop I love the most – the creative part. And this is where I can take advantage of some wonderful plug-ins and textures that are now available. I did not start out creating this fantasy painterly looking image, but I like it more the more I look at it. This image used just a basic cloud texture and Topaz (for website link see my Tidbits Blog sidebar) Simplify 4 to get this dreamy effect. 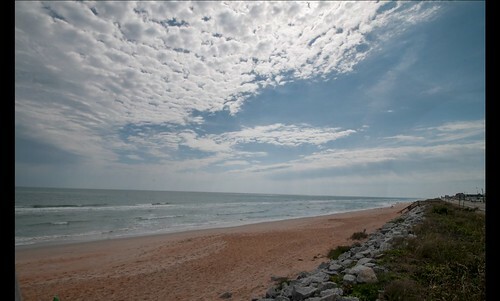 The image uses 5-shots taken along the road to Flagler Beach, Florida. I have always loved this house – it just looks like a Florida beach house to me. The HDR tone-mapped image was created using Photomatix Merge to 32-bit HDR in Lightroom and the resulting Tiff file was then processed. Once opened in Photoshop, Topaz Detail 3 was selected where the Lighten preset was first applied, and then the Overall Medium Detail II preset with the sky painted out to keep it smooth looking. Shadowhouse Creations beautiful free Puff Clouds texture was added in Normal blend mode at 100% opacity. 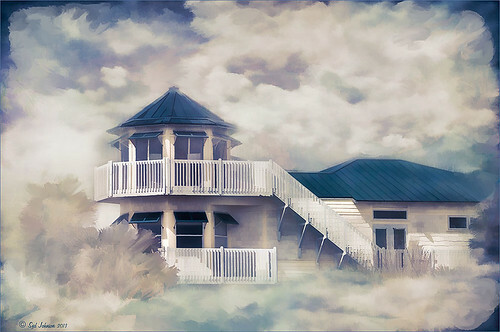 I added a layer mask and painted out the clouds and started getting this really dreamy look by only removing the clouds from the house. Next Painted Textures 2 for Friday Seafoam texture was added and set to Overlay blend mode at 50% opacity. The last step involved creating a Composite layer of all the layers (CTRL+ALT+SHIFT+E) and applying Topaz Simplify 4 Painting V preset to it. On a New Layer above, a Mixer Brush was used to blend in the rough edges of the clouds and give an overall painterly look. A Curves Adjustment Layer was added and the Blue Channel Curve was moved to get the color of blue in the image. That was it! Not real hard but definitely a very abstract artsy look. This was a lot of fun to create! If you like to get a quick painterly feel, Topaz Simplify 4 cannot be beat! The nice thing is that once you apply the filter, even though it may look somewhat canned, you can always use Photoshop’s Mixer Brushes, layer masks, and various textures to make the image your own look – that is exactly what I did on the image above. Topaz Adjust also has several presets that can also give a very nice base painting look. See my blog Digital Lady Syd Reviews Topaz Simplify 4 for more information on this blog. I cannot say enough about using the right texture. Most of the sites I listed have either free or fairly inexpensive small sets to try out to see if you like what they do. Try different textures, and when you find a few you really like, put them together in a special file so you can get to them quickly when needed. (Click on Categories Textures for several links on this topic.) If you like what the color is doing to an image at a particular blend mode, leave it in place. With a layer mask you can paint in localized areas of texture. Photoshop’s Mixer Brushes just cannot be beat for getting some really nice artistic results. They are great for hiding that very contrasty background, or for smoothing out edges, or blending colors that have too sharp a transition. The pink flowers below have the whole background smoothed to get rid of a very contrasty green garden behind them. On a separate layer, a larger sized Mixer Blending Brush was used to fill in the dark contrasty areas, then a smaller size was used to smooth edges. You can always erase areas where you make a mistake since the Mixer Brush strokes are on a separate layer. A couple things to remember when using the Mixer Brushes is that (1) in the Options Bar be sure you are set to Sample All Layers and turn off the layer eyeball if you do not want to pick up color from some of the layers; (2) the Blender Brush is probably the type to be used the most and should be set to a higher Wet field in the Options Bar to work easily – at least 20% and up to 100% give really nice results; and (3) the larger the brush, the longer it takes to lay down a stroke so keep it under 75 pixels if you can. Also take History Snapshots every now and then (or add a Padlock to your base image so you cannot paint on it) so if you get on the wrong layer, which is easy to do, you can go back to a previous step without losing all your previous painting. If you want to add color with a Mixer Brush, just click on the “Load the Brush After Each Stroke” icon (5th one over) in Options Bar. Make corrections with layer masks and apply them (right click and choose Apply Mask) as you go along. Create clone and paint on layers above and merge down (CTRL_E) – then use a Mixer Brush to blend. See my blog Adobe Photoshop CS5′s Mixer Brushes for lots more info on how to use them. There are a couple other ways to get a really nice painterly effect. The brilliant Russell Brown has developed two scripts panels to use inside Photoshop that guides you along as you paint. The oldest is called the Adobe Painting Assistant which has different download links for CS6 and CS5 versions – just keep scrolling. The newest panel is the Adobe Watercolor Assistant Panel that can only be used with CS6. These are all free downloads at this link. The Watercolor Painting Assistant takes some practice to get a really nice result, but it will give a beautiful result. See my blog Dr. Brown’s Painting Assistant Panel for CS6 and CS5! and Think Pink! Rally for the Cure Pink Rose for more information on the older and more user-friendly Painting Assistant Panel. The last effect that has proven to be a real hit the last couple of years is the new Oil Paint filter in Photoshop CS6, although it can be added to CS5 by using the Pixel Bender Panel. 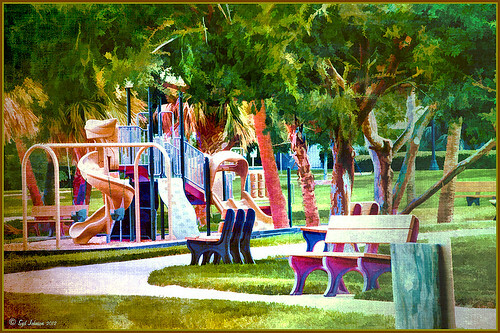 See my blog Photoshop’s CS6 (and Pixel Bender’s) Oil Paint Filter for more information on how to use this filter. It is a lot of fun and easy to do! 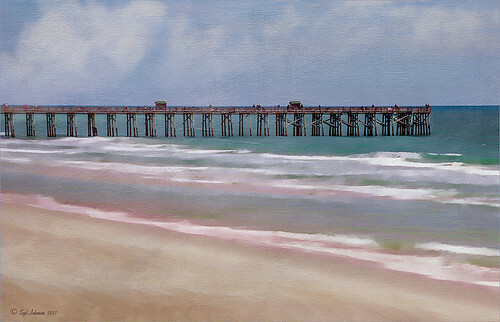 The painterly effect in the Flagler Fishing Pier image was created using a solarized preset and some soft painting with the Mixer Brush. Just had to get out and do a little shooting even though it was major chilly and windy at the beach. 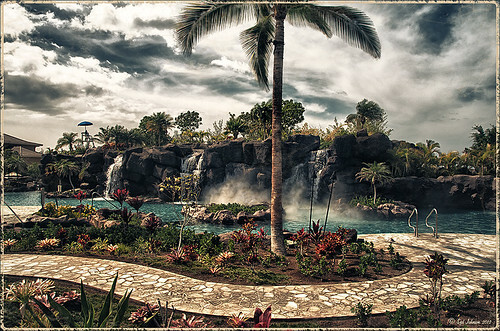 The original image was created from 5 images put together using Photomatix 32-bit Merge to HDR for Lightroom. Once in Photoshop I added two New Layers and added my Cloud Brushes SJ Clouds 1 brush (layer set to 60% opacity) and SJ Clouds 11 brush (layer set to 35% opacity) at 5000 pixels. A New Layer was added on top and filled with black, set to Soft Light, and the opacity set to 23% to increase the overall contrast of the image. (Check out Mark S. Johnson’s Photography Site Photoshop Workbench 374: Creating Dramatic Lighting with Blend Modes on how to do this.) A Curves Adjustment Layer was added and Auto button pressed to get a nice contrasty image. Next Topaz (for website see sidebar) Adjust 5’s Solarized Dreams III preset was applied with Detail Strength set to 0.82 and Detail Boost set to 0. A New Layer was created and Fay Signature Watercolor Smooth Blend Mixer Brush was used to smooth out details in the foreground sand. A Selective Color Adjustment Layer was used and the Blues Cyan was set to +17 and Yellow to +24 – the layer mask was converted to black (CTLR+I inside the mask to invert) and the sky was painted back with a soft white brush. Another Selective Color Adjustment Layer as added to make the sand look the right color in the foreground – Yellows Cyan was set to +100, Magenta -14, and Yellow +1, and Greens Magenta +19. Next French Kiss Artiste Fauve Rainbow texture was set to Hard Light blend mode at 28% opacity. A Hue/Saturation Adjustment Layer was clipped (CTRL+click between the layers) and Saturation was set to -100 to remove the color from the texture but leave the canvas look. This is one of my favorite textures to give a real painted appearance to my images. A Levels Adjustment Layer was added and the center tab set to .85 to add just a little more contrast to the midtones. I really was surprised how painted this image turned out. This image uses Topaz Simplify 4 again and textures to get the painterly look. I decided to show this image as it is a favorite technique of mine to use the power of good textures to give that painterly effect. The basic image was very nice with to begin with and probably would have been fine with just the Lightroom tweaks, but I thought it would make a beautiful painterly piece. Topaz DeNoise was run on this image since it had a 2000 ISO setting. 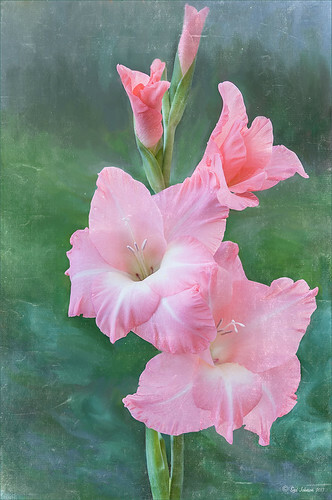 On a duplicate layer Topaz Simplify 4 was applied using the Watercolor II preset – in the Localized Adjustments section, the pink and white flowers were lightly painted back to bring back some detail but leaving the background with a very soft look. Once back in Photoshop the detail was still not strong enough so the DeNoise layer was duplicated and placed on top of the Simplify layer. A black layer mask was added and the flowers were softly painted back using a white low opacity brush to add a bit more localized detail to the image. Two beautiful textures from Melissa Gallo at Painted Textures were added on top: 2 for Friday Set 2 Creamsicle at Hard Light blend mode at 74% opacity, and Cyber Monday Set 1 Winter Wheat set to Linear Light blend mode at 78% opacity. On the top texture a Layer Style was opened and on the Blending Options page, the B channel was turned off. One of my new favorite textures is by French Kiss – Studio 3 White Wash – it was added using the Overlay blend mode at 65%. All of these textures are really great for getting the painterly effect. Once all these textures are added, you really have to try different blend combinations and opacities. It is not at all unusual to have to add a layer mask and paint out areas that are not working right. In this image I added a layer mask to the white wash texture and painted out just a little bit around the edges of the flowers to get them to stand out a little. In fact I had actually added a different top texture and decided I did not like it and started looking for a different texture when I came up with the white wash texture. I had to back and add a Mixer Brush layer to get rid of some distractions in the original image once the textures had been added and it looked bad. If you do not like the way the painterly effect is flowing, it probably is not quite right and you need to walk away and come back again later – it really is a work of art you are working on. If you just want a nice painterly brush texture on top of the whole image, check out my Getting a Nice Painterly Landscape Effect with Topaz Simplify and Texture for a short workflow – this gives a nice finishing look to an image if there is not enough of a painterly effect already. Digital Lady Syd’s Rule No. 6: Try Something New! Using Topaz Simplify for That Artistic Feel! Topaz Adjust Using Painting Venice Preset – Beautiful Effect! 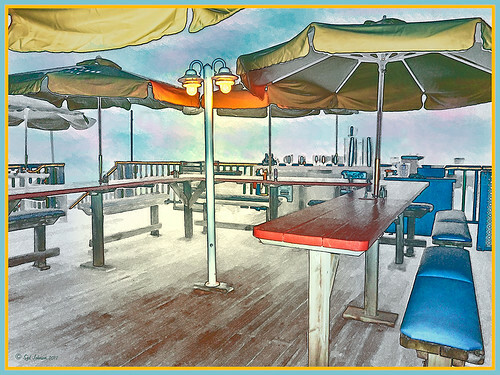 Topaz Simplify and Lens Effects Saves an Image! My Version of Photoshop Tennis! I really love taking photos but I am slowly realizing that once in Photoshop, I end up with something entirely different than what I had in mind! There is an older book, Photoshop Secrets of the Pros by Mark Clarkson, where players “pass images back and forth making changes as they go” for a set number of rounds, ie., Photoshop Tennis. This book first got me thinking about doing radically different effects to images. Last week I did a blog on Digital Lady Syd’s Photo Art Workflow where I basically showed what I do to give a different feel to an image. This week I am continuing with that theme showing other options to get more of that photo art look. The images are also examples of what happens when I start playing around with different combinations of effects in Photoshop – I am never quite sure what I will end up with. I also downloaded and tried Photomatix Pro’s new program Merge to 32-bit HDR this week so that was part of the first two images’ workflow. 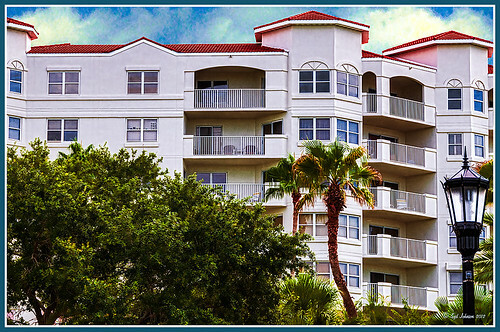 This image of the Ormond Heritage Condominiums (located where the old Hotel Ormond used to reside in Ormond Beach, Florida) was first processed as a five-image HDR shot using Merge to 32-bit HDR. 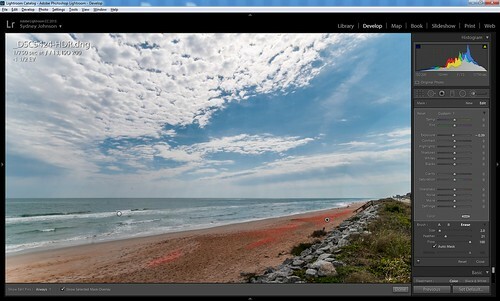 The really neat thing is that if you already own Photomatix HDR Pro 4.2 and Lightroom 4.2, you can download it for free from the link above. All you do is select all the HDR images in Lightroom, go to File -> Export and select Merge to 32-bit HDR (or just right click and go down to Export and select the program). A dialog opens where I chose the following: Preprocessing and Merging (Align Images, Crop aligned result,by matching features, and include perspective correction) and Remove ghosts; and Name Merged File: Combined file names and check Stack with first selected photo and Scale pixel values to fixed range. 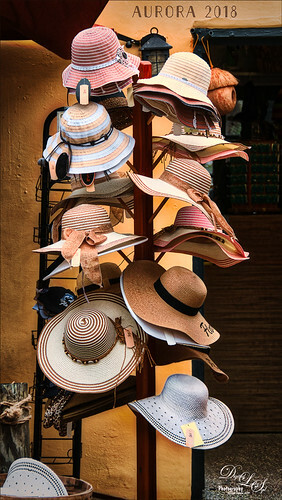 The images are processed very quickly and a TIFF file is placed back with the original images, just as if you had done this in Photoshop’s Merge to HDR, except Photomatix never opens up a program – it all happens inside Lightroom. What a cool little program from Photomatix! The above image was mainly processed in Topaz photoFXlab (see sidebar for website at my Tidbits Blog) plug-in using Topaz Adjust presets. See Image 1 settings below for more info. When adjusting the crop on the top image in Lightroom, I got a quick look at what a small crop would look like. 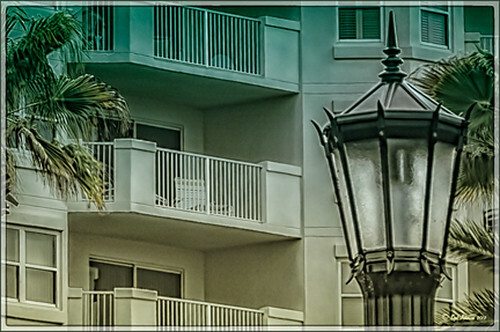 Basically I just liked the way it looked – the frosted light of the lamp post and the comfortable porch balconies make you want to sit outside and enjoy the view and weather. The only thing done on this image in Photoshop was using Nik Color Efex Pro 4 and stacking a bunch of filters: High Key, Sunlight, Detail Extractor, Dark Contrasts, Bi-Color Filters and Image Borders. It just works! This image was also processed in Lightroom using PhotoMatix Pro’s Merge to 32-bit HDR. I then did my adjustments on the resulting TIFF file in Lightroom. In Photoshop I decided right away to use the new Topaz photoFXlab program where Topaz Simplify and Topaz Lens Effects were used from the Plugins tab. See settings for Image 3 for the exact info on how this was applied. Here is the same image with exactly the same settings as in the image above except for the framing, but the twist is that a Hue/Saturation Adjustment Layer was clipped to the Vivid Light texture and set to a Difference blend mode at 71% opacity. I loved the way it looks like as if it is being drenched in some bright light – almost a spooky feeling. I am glad I did not stop with just the image created above as I think I like this one better – there may be more of a story in this image. 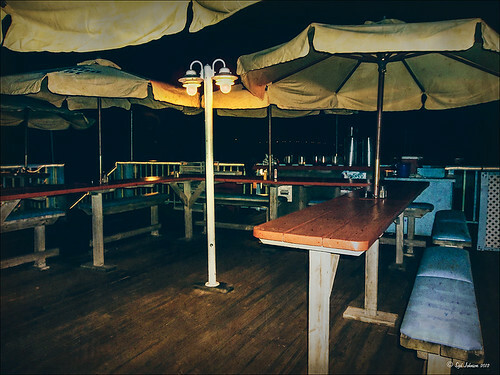 The next two images show an example of starting with a night photo taken with my point-and-shoot camera at the Gold Lion Cafe in Flagler Beach, Florida, and turning it into a really interesting almost wintery looking sketch. I did not exactly plan this result. The night image is definitely what it looked like that night as I sat topside and listened to the ocean waves rolling in. But I really like the final image with the artistic pop added. Here is the image with a more photo art feel. Both images took a lot of manipulation but the second one used the Layer Styles dialog to get the beautiful color out of it. See Image 6 settings below to see how this was done. Settings for Image 1: Once the Tiff image is taken into Photoshop after making Lightroom adjustments, the background layer was duplicated Topaz photoFXlab plug-in was opened. After duplicating the layer, the Mask tab was selected and the plain sky was deleted. A new cloud image was load using +From File and placed under the top layer. A stamped layer was created using +From Stack and Topaz Adjust was opened up and Photo Pop preset was applied. In the Brushes tab, detail was increased throughout the image. PhotoFXlab was exited. The background was duplicated again and put on top in Photoshop. This layer was taken into Topaz photoFXlab again and Topaz Adjust’s preset Painting Venice was applied. 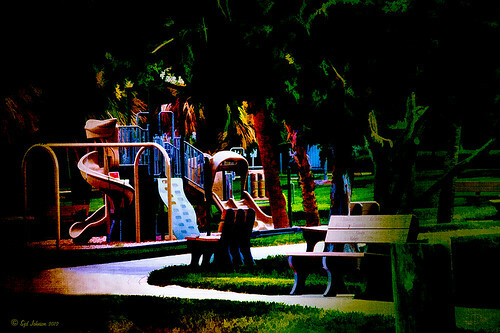 Back in Photoshop a black layer mask was added and the bright areas of the image were painted in to add depth to the trees in the image. ShadowHouse Creations You’d Be Surprised texture was applied using Overlay blend mode at 34% opacity. Finally a Curves Adjustment layer was added. My frame layer style (see DLS Free Layer Style Frames) was added sampling colors from the image. Settings for Image 3: Duplicated layer in plug-in. In Adjustments tab used these settings: Temp -4, Tint 23, Sat -12, Exp 1.80, Contrast -8, Dynamics 49, Sharpness 51, and Shadows 22. In InstaTone tab image from 500 px of an orange leaf from Aliona Shewtsova and set the layer to Saturation blend mode at 74%, which really brought out the colors. Next a +From Stack stamped layer was created. In Plugins tab Topaz Simplify was opened and the BuzzSim preset was applied as is. In the Adjustments Tab these settings were used: Temp -17, Contrast -5, Dynamics 87, and Sharpness 3. Layer opacity was set to 83%. Stamped using +From Stack. Plugins Tab used Lens Effects and applied Vignette Selective section-Soft Olive Green preset with these settings: Center on right side of slide, Vignette Strength 0.21, and Opacity 50%. Exit plug in. Exit Topaz photoFXlab. Flypaper Apple Blush taster texture was applied using Vivid Light blend mode at 100% opacity. A Curves Adjustment Layer was applied with the individual channels being adjusted to bring out the colors I wanted. My thin double edges layer style was applied (see DLS Free Layer Style Frames). Settings for Image 5: After basic color adjustment in Lightroom (just a single shot), this image was opened in Photoshop CS6 and Nik Color Efex Pro 4 plug-in was opened. These filters were stacked: Midnight using Neutral Color Set set to 65% Overall Transparency; Bi-Color Filters using the #1 Color Set; and Photo Stylizer using Cool Silver, Style 1, Strength 38% and Overall Opacity 61%. 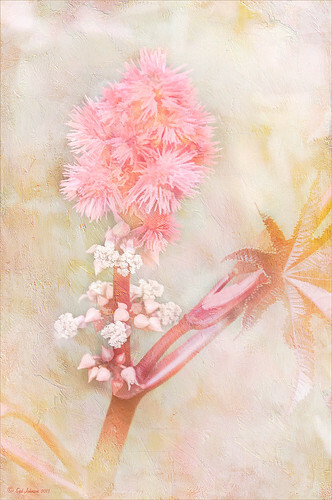 Back in Photoshop Sarah Gardner’s Blush Ginger texture was added and set to Overlay blend mode. The new Lighting Effects Filter in CS6 was used to add some soft light to the center lantern lights – the Spotlight effect was used at an Intensity of 7 and Ambience of 60. A Color Lookup Adjustment Layer set to Abstract and Gold-Blue and the layer was set to a Screen blend mode at 64%. OnOne PhotoFrame (see sidebar for website at my Tidbits Blog) Emulsion 02 was added sampling a dark color from the image for the color. Settings for Image 6: After applying the same Color Efex Pro filters as Image 5, the image was opened up into Topaz Simplify and a Sketch preset I had previously created was applied so that the lines looked pretty much like a black and white sketch. (To create, use Mode Edges; Colorspace RGB and all sliders in Simplify section – set all to 0.00 except Details Boost 1.00, Remove Size 0.08, and Remove Weak 0.10; Adjust section – Brightness 0.00, Contrast 0.73, Saturation 1.40, and Saturation Boost 1.92; and Edges – MonoEdge Normal, Edge Strength 5.00, Simplify Edge 0.22, Reduce Weak 0, Reduce Small 0, and Flatten Edge 2.28. To adjust the sketch detail and darkness, adjust the Simplify Edge slider.) Now here is the tricky part – a Layer Style was added by double clicking on the layer and in the Blending Options dialog, the Blend If section is used. On This Layer, the black tab was split by ALT + clicking on the tab the split tabs set to 0 and 164 – the white tab was left at 255. On Underlying Layer, the White Tab was split and set to 0 and 72 and the Black Tab left at 0. It looks really weird but it gave me the color effect I liked. This layer was set to Lighten at 100% opacity. A composite layer was created (CTRL+SHIFT+ALT+E) and using Select -> Color Range, the white was selected. CTRL+Backspace to delete the white from the image. Two layers were created underneath the top layer and using Best Mcbad Watercolor Brushes 22 and 30, a watercolor sky was created using blue and light pink. A Hue/Saturation Adjustment Layer was added to increase the saturation in the Yellows. A Curves Adjustment Layer was added to increase contrast. This image used different settings for the Lighting Filter – Intensity 5 and Ambience 93 – only wanted a slight glow since it is daylight. Some clean up was done. My Layer Style (see DLS Free Layer Style Frames) was added to frame the image and that was it! Whew!